There’s trouble beyond the (pay)wall. Hotstar had been aggressively promoting the Game of Thrones Season 7 premiere on its streaming service. The company had done its bit in attracting users — hotStar was to air the episode at 7:30 am, mere hours after its US broadcast. This would’ve been the soonest Indian audiences would be able to legally watch the show — on TV, Star World was to air will air it at 11 pm on Tuesday. And Hotstar had been running a campaign against what was its biggest competitor — illegal torrents. But eager users who tuned in to HotStar at 7:30 were unable to watch the show. “Playback issues!! Any premium user able to stream on hotstar? I am getting ACN_3005 error,” complained a Reddit user. “I bought premium so that I could watch the episode as soon as possible. Kept getting this error instead, and had to torrent the episode. Never using Hotstar again :/,” said another. Users also took to Twitter to complain. Game of Thrones’ new seasons are some of the most anticipated television events on the calendar, and users were unhappy at having paid for a subscription that didn’t work. It’s unclear what caused the the error, but it shows how hard traditional streaming services will find to compete with torrents. Torrents are illegal, but are still widely used, and their distributed nature ensures that such outages don’t happen. Torrents were also available sooner than the episode on Hotstar; users reported finding torrents by 6:55 am, while the episode only officially appeared on Hotstar by 7:30 am. 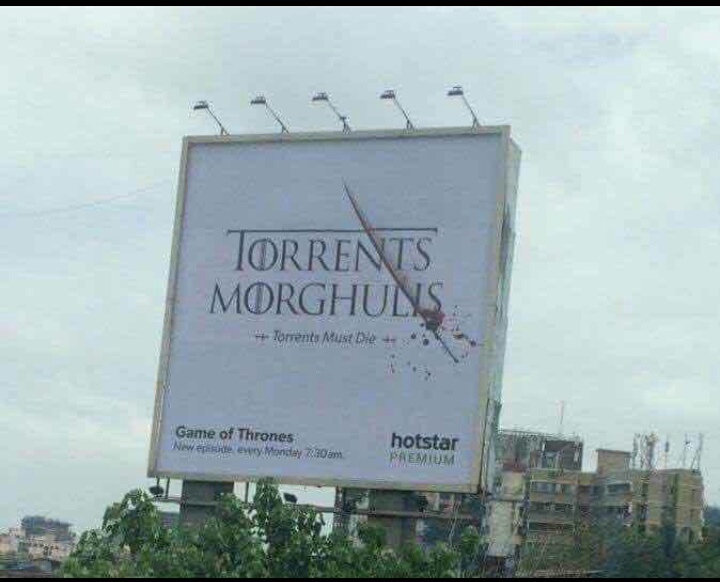 Hotstar managed to eventually get around its issues and start streaming the show, but as this experience shows, TorrentsMorghulis might not happen anytime soon. Update: Hotstar has contacted OfficeChai and said that their site is now back up. “As a service, we are proud that we have built a platform that can handle big surges in viewership. This morning, however, we faced an unprecedented surge in interest around the opening of the new season of Game of Thrones which resulted in a service disruption of about 8 minutes. We are deeply apologetic for the service disruption,” said Hotstar CEO Ajit Mohan.